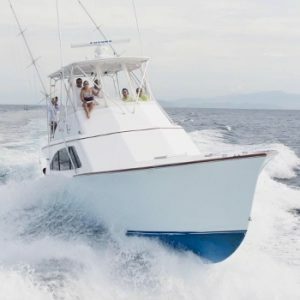 This totally rebuilt and refurbished 43ft Cold-Molded Flybridge Sportfishing Yacht powered by twin 450HP Caterpillar C7 electronic engines fishes out of Los Sueños marina in Playa Herradura. Captain Carlos Espinoza is at the helm. It has a Furuno Nav/net 12KW color & GPS chart; Furuno FCV 1100 color sounder with duel transducer; Simrad J300X RPU auto pilot; 160gal pump and two ICom VHF radios; Penn reels, heavy and light tackle; stand-up and fly rods; tuna tubes, a 169 sq ft cockpit, Release tuna chair with rocket launcher back rest, heavy-duty Release helm chair; and an a/c salon and head.